Meet Lady Garmin, I rarely go anywhere without her. She’s the timekeeper of my happy pace, she pushes me when I’m not going fast enough and she sings happily to me when I get a new PB. I love her. I was given this watch as a present as I embarked on a new marathon training plan and even though I’ve only ever had one Garmin before I have been super impressed with everything this watch can do. To start with, the Garmin Forerunner 220 lets your friends/family/coach see where you are during a training run or a race, providing you’ve got your phone with you and are using the Garmin Connect app. I don’t run with my phone often as I like time out from it on my runs but I do take it with me on particularly long/rural runs and this feature is great if you’re racing or for worried parents/significant others! Let’s start from the minute you put the watch on shall we. The lightweight design makes it feel as though you’re barely wearing a watch and the strap is comfortable and does not rub. There’s absolutely no delay in connecting to GPS to get going – just press the run button and you’re off. 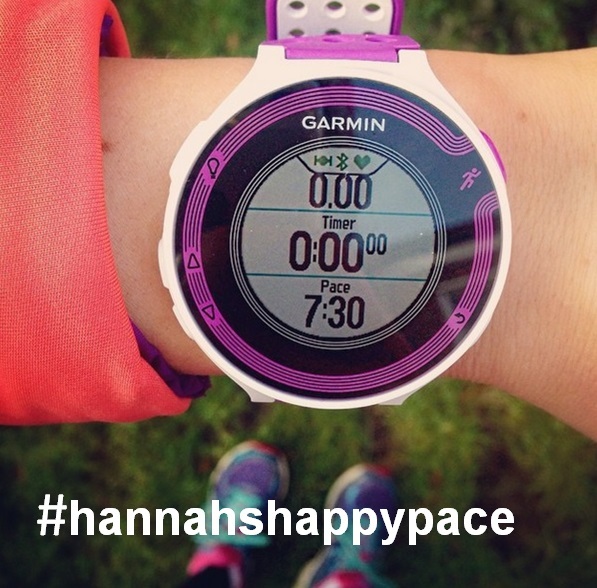 Once you’re running Lady Garmin automatically pauses when you stop and starts again when you continue on your run – this means there’s no need to keep clicking stop/start if you have to stop at traffic lights. 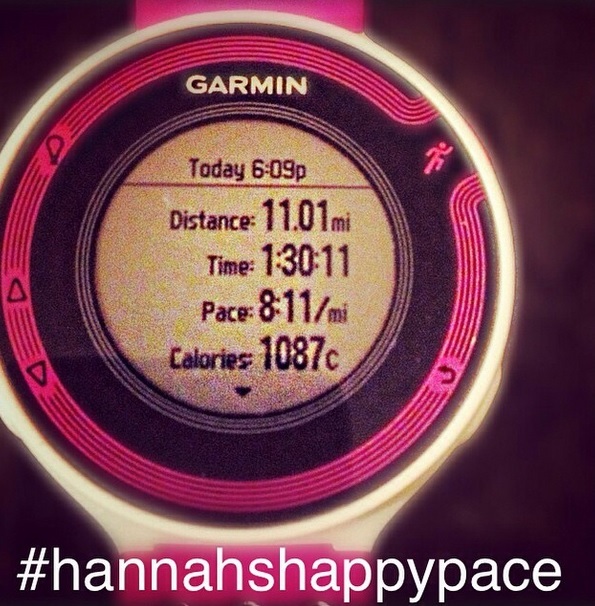 You can also set her up so that you get vibration alerts if you’re going too fast/too slow compared to your goal pace. Although if you don’t want that feature on make sure you turn it off as she will keep buzzing away at you if you’re too slow! You can customise the display shown when you’re running and this can include distance, pace, time, average pace, heart race zones (comes with a very comfortable heart rate monitor), calories etc or you can set up two screens and switch between the two. You can switch between them manually or set it up so that the display switches between the two automatically. After your run you’ll be told your distance, average pace, cadence, calories burnt and can then see your mile/km split times. If you’ve managed a new personal best your Garmin will sing and beep happily at you to say congratulations on the new PB and this will be stored on there for you to have a look at and remind yourself of how fab you are at any time. 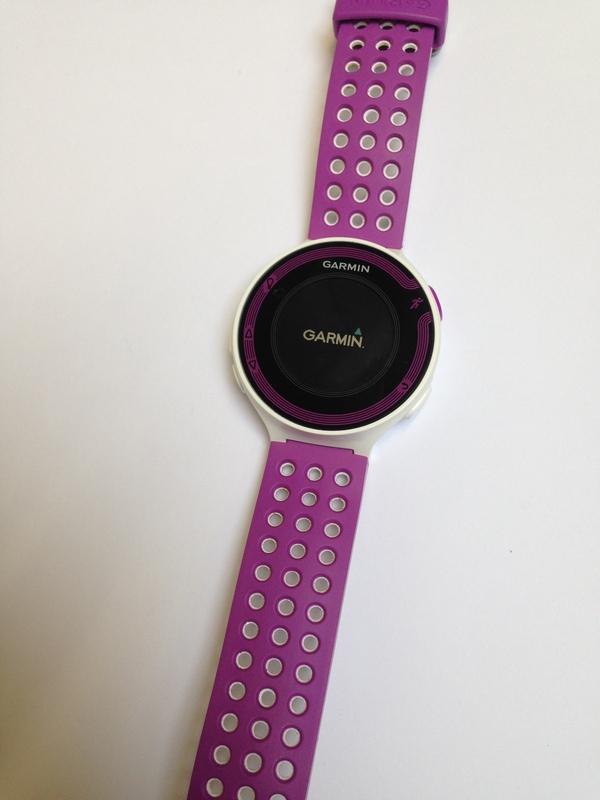 Lady Garmin also programmes interval workouts and there are free training plans and support on Garmin Connect which you can download and load on to your watch for coaching as you run! If you’re looking for a new watch I’d highly recommend taking a look at the Garmin Forerunner 220 for not only a reliable and accurate watch but one that’s going to push you too! When I start my 24 week Berlin marathon training plan (more on that to come soon!) in a few weeks I’m going to start wearing my heart rate monitor a lot more so that I can learn more about my body and how to perfect my pace.